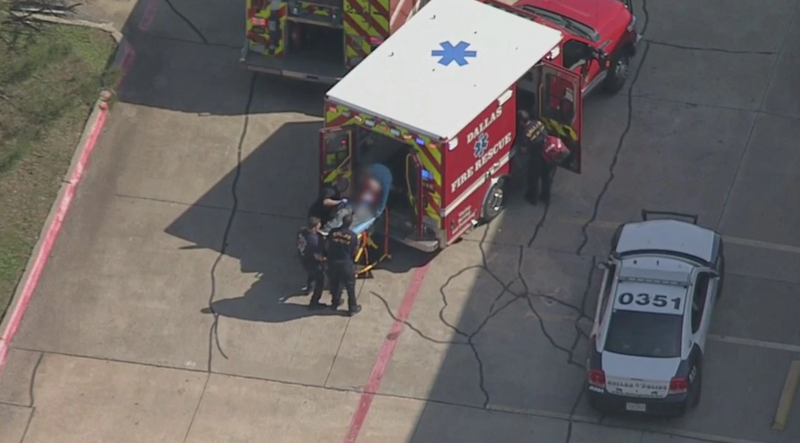 DALLAS -- Two Dallas police officers were shot and critically wounded Tuesday afternoon in a shooting at a Home Depot, CBS Dallas/Fort Worth reports. A store loss-prevention officer was also shot in the incident in northern Dallas, according to Police Chief U. Renee Hall. After a brief car chase, a suspect was arrested along with a female passenger. At a late night news conference, Hall said that suspect Armando Juarez faces multiple counts of aggravated assault on a police officer. Also it was announced that all three victims were out of surgery. "Our police department was attacked this afternoon," Dallas Mayor Mike Rawlings said during a news conference earlier in the night. "I continue to be upset at the lack of respect for our police in this city and this country," Rawlings added. A source told CBS DFW that a male police officer was shot in the back of the head and a female officer was shot in the face. A large police presence was seen outside the store and one person was seen being loaded into an ambulance. Police identified the suspect as Armando Juarez, 29, and was wearing a white T-shirt and blue jean shorts. State, local and federal authorities assisted in the manhunt. Police were looking for a white pickup truck -- possibly a Ford F250 -- with "GX4" on the back fender, a ladder rack and large exhaust pipes rising from the front of the bed. Police with guns drawn were seen at the back of the Home Depot as employees appeared to be rushing out of the back of the store and away from the area. "The officers got him and they started doing the shots it was about seven shots that we heard," said Mercedes Espinosa, a Home Depot employee. "I've seen two officers down surrounded in a puddle of blood." A massive search from police helicopters in the air and on the ground followed after witnesses reported the shooter fled on foot and may be hiding in a nearby creek. But when police reviewed security camera video they discovered the suspect took off in the pickup truck. Inside the store, employees and customers either froze in panic or fled in fear from the brutal violence that played out in front of them. The store was evacuated and workers were sent home for the day. In a tweet earlier Tuesday, Dallas police asked for prayers for the officers and their families.